I used to teach at a small liberal arts college in the Bible Belt. I could probably run a whole series of posts just about my adventures there (ask me sometime about the impromptu lesson on birth control I gave once in an astronomy class), but honestly it wouldn’t be that interesting. 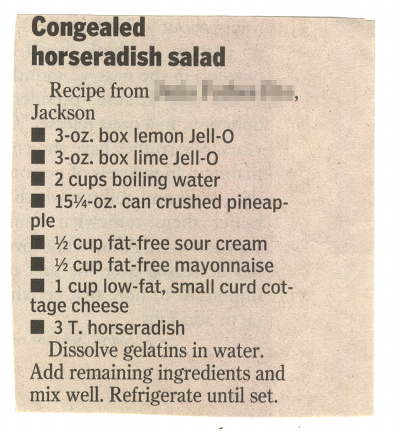 I’m including this recipe, not because it actually has to do with the blog post, but because it’s another example of life in the Bible Belt. One minor episode involved a civil but very frustrating conversation with a colleague, a professor of philosophy (if I recall correctly). He was a very vocal proponent of Intelligent Design (ID), the slightly more socially acceptable version of Creationism that doesn’t generally require a young age for the Universe. In other words, for many people, ID can seem like a moderate position between the “extremes” of evolution and young-Earth Creationism (YEC). However, this conversation wasn’t primarily about ID, but about physics—specifically, his idea that electrons (among other particles) are “theoretical entities”, objects that may or may not exist because we can’t perceive them directly. My first reaction was confusion: I thought he was mixing electrons up with something else (say, the Higgs boson, since this was in 2009) that hadn’t been found experimentally. No, he really meant electrons, and he really seemed to be espousing the view that something must be perceived directly by human senses in some way to be considered real. As you might expect, I was a tiny bit flabbergasted by the ignorance of the last 120 years of physics—in what school of philosophical thought are electrons considered controversial? However, upon reflection, I found his requirement for something to move out of “theory” (as he seemed to define it) into certainty to be even more bizarre. I didn’t ask him about cells or distant galaxies (which require microscopes and telescopes, respectively), so I don’t know if his epistemological system allowed him to accept their reality, but I suspect the answer is yes. A reality based only on unaided perception is so incredibly tentative as to be useless—and that doesn’t even get into the theological issues, since he was (among other things) a Christian minister. I was reminded of this particular encounter when I read this excellent post by Stephen Curry about the problem of science communication when the objects under examination cannot be perceived directly. As Curry notes, the modern atomic model of matter faced serious opposition, not least because the atoms themselves couldn’t be seen, even with the most powerful microscopes. (It didn’t help that the modern view of atoms is substantially different from the ancient Greek philosophical concept, which is why I get annoyed when science writers begin discussing atoms by invoking Democritus. But that’s a rant for another day.) Physicists including Ludwig Boltzmann recognized that atoms could explain a huge variety of phenomena, and found it frustrating that many scientists and philosophers dismissed the atomic theory. Of course, no serious scientist now doubts the existence of atoms: the evidence in favor of their existence is overwhelming, even though they can’t be “seen”. Atoms will never been seen by human eyes. The size of an atom is roughly 10-11 meters across, or 0.0000000001 inches. Visible light is between 700 and 900 nanometers, or 7×10-7 and 9×10-7 meters—about 10 thousand times larger than an atom. Even the most powerful microscopes humans can look through can’t see anything smaller than the smallest wavelength of visible light. Smaller wavelengths don’t help us, either: the energy of light is inversely proportional to its wavelength, so shorter wavelengths mean higher energy. By the time we’ve reached the size of an atom, the energy is high enough to ionize the atoms (kicking out electrons), or otherwise interact with them. Of course, we do “see” atoms by the light they absorb and reemit, but we’re not seeing the atoms themselves. The question is how we interpret our experiments, and whether we are bothered by relying on evidence that isn’t sensory. Modern scanning-tunneling electron microscopes can map the distribution of electric charge, which provides something resembling images of atoms, but it’s not what we would see with our eyes. However, between electron microscopes, the famous oil-drop experiment of Robert Millikan (repeated over and over by physics students, including many of my own), cathode-ray tubes used in oscilloscopes and older TV sets, electron-diffraction experiments, various particle-physics experiments, etc.—over 100 years of study in all—have established the existence of electrons beyond reasonable doubt. It’s a matter of evidence. Any of these experiments could have cast doubt on our theory of the electron, but they didn’t. We know electrons are fundamental particles (not made up of smaller constituents), possessing a fixed amount of electric charge, mass, and spin. Repetition has solidified our theory as well: doing the same experiments over and over may seem redundant, but it ensures we haven’t overlooked anything anomalous. In other words, we don’t need to see, hear, smell, or taste electrons directly to know they exist. The differences between scientific and sensory evidence are impressive, and there’s no question which I trust more. The eye can be fooled, the ears can play tricks, touch can lead us to believe metal is colder than wood when both are at the same temperature. A well-designed experiment is much harder to fool, especially when repeated by others. Of course, my statements here are a bit rosy-eyed. Real experiments are often messy, and frequently produce ambiguous results. Additionally, data must be interpreted by human beings, which introduces problems of bias and (yes) sensory shenanigans. My point isn’t that science is perfect, but that it’s a reliable guide, more so than our senses alone. Yes, we have theories that involve electrons (including quantum electrodynamics), and those are essential for explaining their properties. Theory and experiment go hand-in-hand in science. The mere existence of electrons is a fact, but that’s not meaningful by itself. Theory provides us with the means to understand how electrons interact, and the roles they play in atomic structure, materials, and the total mosaic of matter. Similarly, quantum physics is a nearly comprehensive theory. (It doesn’t include gravitation, so it isn’t complete yet.) Atoms, electrons, photons, and the like demonstrably exist—the “facts”—and quantum theory tells us how those parts fit together. There’s plenty to learn about the Universe, and one of the fundamental bits of quantum physics (the meaning of measurement) still trips us all up, but quantum mechanics isn’t (aren’t? stupid collective nouns) going anywhere soon. Entities such as electrons, far from being less real because we can’t perceive them directly, are foundational to our understanding of the Universe. We don’t need to see something to know it exists, or else we couldn’t live our daily lives, much less do science. Not only can we see into dark spaces through scientific exploration, we can “see” where vision isn’t even possible.